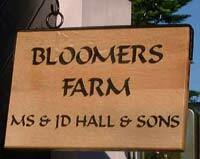 The most popular timber for wooden signs is Oak and in our opinion, it is the most beautiful timber. However we do sell a lot of Sapele for its deep red colour and Iroko for its high oil content - needs less maintenance. Have a look at the Gallery. This is by far the most popular timber we use for house signs. The English oak has a majesty all of its own, with beautiful variations in grain, texture and colour. It is a heavy wood and is strong and durable. Providing it is maintained it will last a lifetime. 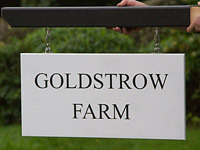 We also make large oak signs for farms and estates. Iroko is a useful timber which looks quite similar to teak. It is stable, dense and full of its own natural oils which makes it very durable - perfect for outdoor signs. It is a timber which can be left untreated, although oiling a couple of times a years keeps it looking as new. Its rich, lustrous, and variable reddish-brown colour give it a mahogany-like appearance. However unlike most mahoganies, Sapele has substantially less movement in service. It is also even harder than oak. Very good value timber. Solid wooden plaques in 5mm maple, walnut, cherry and oak are ideal for indoor wooden signs and plaques including office door name plates. There is also a wood veneer which is is 3mm thick and perfect for engraved wood plaques, keyrings and trophies. These are very unusual signs and really do show the grain of the wood. The letters are slightly proud and the background is sand blasted away leaving the driftwood effect. These are made in oak, rustic, cherry, sapele and iroko. They are available in a variety of sizes, fonts and can be done with or without borders. Prices start at just £14.10 for a simple 4" x 4" wooden number. Extra text can be added under the number. 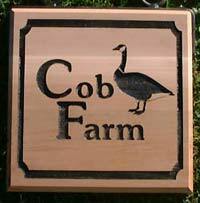 These lovely house signs and wooden plaques are made in various sizes using Oak or Iroko. Iroko, similar to teak is a useful hardwood in that it is full of its own own. Oak is very beautiful but must be well maintained to stay looking at its best. Wording and images are engraved into the wood using our latest laser technology and painted if required. Made to order sizes also available. Rustic timber slices make interesting house signs. Each piece of timber is different so each sign is individual. The bark is left on and the whole sign is varnished. They are made in 6 sizes - from 150mm to 600mm (6" to 2') These are ideal for house signs, house numbers and even be used as memorials. This are available as natural oak varnished, iroko oiled or various painted timbers. Large range of colours. Ideal for the end of a drive or at the entrance to your home. Various standard sizes or made to order. Can be morticed or front fixed with options for post tops. The timber can be oiled for a rich finish or left untreated to weather to a beautiful silver grey colour. 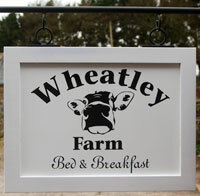 This is a good option if you want a wooden sign without looking after it! Black and white painted oak signs are very traditional, but with the use of a modern font, their clean cut style would look very smart in any situation. 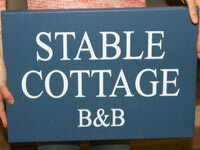 They can be used as single sided house name signs or doubled sided hanging signs. As well as black and white painted signs we have a whole range of Farrow and Ball colour matches. Accoya starts life as Radiata Pine which is a fast growing sustainable timber. The wood is then modified by acetylation which changes the chemical structure from the surface to the core. Acetylation creates the high performance wood, more stable and durable, mainly due to the fact that it almost eliminates the woods ability to absorb water. It can withstand the toughest outdoor environments and requires far less maintenance. Extensive testing has shown that paints can last up to three times as long on Accoya compared to unmodified wood. If you are looking for a good value painted wooden sign, the tricoya board is an excellent option. The board is a wood based board made using a high performance resin. It is very stable, strong, durable and weatherproof. Tricoya itself comes with a 50 year guarantee. It is also environmentally friendly. The main disadvantage is you cant see a wood grain. These are top quality wooden framed signs which are designed to last. They feel very solid and have a substancial weight to them. The style may be traditional but we do use the latest panel material and paint system, along with a solid Accoya wood frame.The inner panel is made from Tricoya. The frame and panel are then sprayed with a two component polyurethane paint which is far more durable than standard brush-on paints. 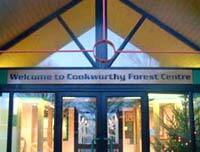 We use five timbers for the large signs - Oak, Iroko, Sapele, Red Cedar & Douglas Fir - each having particular advantages and disadvantages. All timbers are at least 1 inch 25mm thick but can be as much as 47mm.. We can make boards up to almost any size. 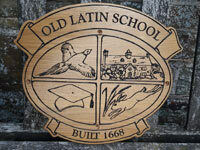 The large oak signs are the most popular choice, but other timber should also be considered. This pages describes how the signs are made and has full details of each of the different timbers we use. These include oak, sapele, douglas fir, cherry, cedar, balau, opepe, sycamore, ash, idigbo, accoya and iroko. There are various options with the finger posts. Wooden finger posts can be made from natural oak or iroko with 70mm or 95mm posts. The large posts can be octagonal or squre. There is also a range of painted wooden finger posts. You can have one finger or up to seven fingers on a post. If your are not sure of how you would like your wooden sign or memorial to look and are in need of inspiration, have a quick look at this page first. It contains lots of photos of wooden signs and wooden memorial plaques we have made for our customers. We have included details about each plaque. Just click on the photos for more information.